This restaurant has not been reviewed yet - Helene Darroze, comes from the southwest of France and remains faithful to traditions. The foie gras and poultry come from the Landes, the beef from Chalosse, the salmon from the Adour river and the milk-fed lamb from the Basque Country. A woman in a world of men. 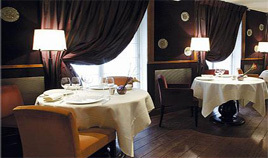 A refined and very sensitive cuisine in the heart of Saint Germain des Pres district, just off Luxembourg Gardens. A gourmet controversed restaurant in Paris. (Very different opinions from a customer to another). More about Helene Darroze : Cooking requires physical force. I admit I ask for help to lift big pots' this is what Helene is saying when told about the fact to be one of the only women enjoying a Chef reputation.